As good as Lamb of God have been in the past (my personal highlight being 2004's Iraq War and alcoholism-themed Ashes of the Wake, which hit at the peak of the NWOAHM and amidst popular opposition to GWB) there's no denying that they've been on a downward spiral, culminating in 2012's disappointingly dull Resolution. The immediate good news is that the pretentiously-titled VII: Sturm und Drang is a good step towards reversing that trend, certainly their best and most invigorated-sounding album since 2006's Sacrament. How much of this can be said to be down to vocalist Randy Blythe's manslaughter trial in the Czech Republic is debatable, but it certainly seems to have been an important factor and has fuelled photography exhibitions and a book by Blythe. 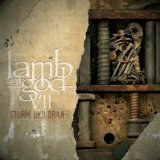 Whatever the reason, Lamb of God sound invigorated again, and have released a more than solid album with a genuinely interesting guest vocalist spot making Sturm und Drang something of a must-have for fans. There are actually two guest vocalists on the album. The first and by far the best is Deftones' Chino Moreno, popping up to provide soulful clean singing on Embers, which opens with a percussive build that's fairly typical for the band, although it sounds heavier and angrier than I remember the band being. A quick, near-thrashy pace keeps your head nodding, and Chino makes his appearance after a brief melodic breakdown, his singing contrasted with a particularly rabid Blythe snarl in a way so natural and befitting the band that I can't help but wish for a Palms-esque crossover project. It's good enough to stand out in a first half already loaded with killer tracks; opener Still Echoes marries the band's usual outraged gallop with some of the natural songwriting ability that filled earlier albums with hooks, and the following one-two of Erase This and 512 keep the tension and metallic aggression high. The second is The Dillinger Escape Plan's Greg Puciato, who I wouldn't have known was present on Torches if I wasn't told, popping up to provide some fairly ignorable backing clean vocals and one yell. It's interesting, as mentioned, but for all the wrong reasons, not providing enough personality to make the track stand out and making the album end on something of a disappointing note. Still, elsewhere the chugging heaviness of the likes of Footprints and the almost Alice in Chains-esque balladry of Overlord work terrifically, the latter showing off Blythe's clean vocals very well before switching to become the heaviest track on the album. Engage the Fear Machine is a real late-album highlight, putting the band's taste for groove to work to produce an infectiously-written song sure to be in the Lamb of God live set. And the two bonus tracks present on the special edition are good enough to make that worthy of a purchase for fans, Wine & Piss and Nightmare Seeker solid slices of the band's usual piss and vinegar. Not a brilliant album, all in all, but not a disappointment, which is a step forward for Lamb of God. Let's hope they can regain their real heights next time around.